Receivable lets you define standard payment terms for your customers. Payment terms can include a discount percent for early payment and you can assign multiple discounts to each payment term line. You can define proxima payment terms to pay regular expenses such as telephone bills and credit card bills that occur on the same day each month. You can also create split payment terms for invoice installments that have different due dates. You can use your payment terms to determine the amount of each installment. Receivables let you either distribute tax and freight charges across all installments, or allocate all freight and tax amounts in the first installment of a split term invoice. Receivables displays the active payment terms you define as list of values choices in the Customers, Customer Profile Classes, and Transactions windows. IMMEDIATE: The balance of the transaction is due immediately (i.e. on the transaction date). You can use this payment term with your chargebacks and debit memos. Enter the Base Amount for this payment term. The default is 100, but you can change it. The base amount is the denominator for the ratio Receivables uses to determine the amount due for instalments of invoices to which you assign this payment term. The sum of the relative amounts for all of the payment schedules that you define for these payment terms must be equal to the value that you specify as a base amount. If you want transactions assigned to this payment term to be printed before the due date, enter a number of Print Lead Days. Receivables will print this transaction x number of days before the due date, where x is the number of days you enter here. To associate a credit check with this payment term, check the Credit Check check-box. 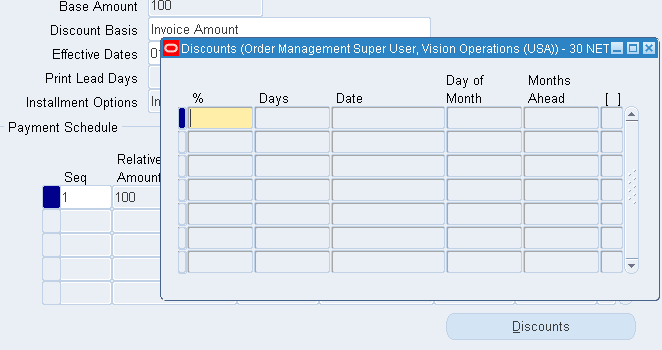 Oracle Order Entry uses this information to determine when to place an order on hold. In Oracle Order Entry, if the profile for an address does not have credit checking limits defined in a particular currency but the customer does, then the order passes credit check. If the address does not have limits in the currency and neither does the customer, then the order is compared to the customer limit in that currency. If you do not want to let your customers take discounts for partial payments on items associated with this payment term, uncheck the Allow Discount on Partial Payments check box. 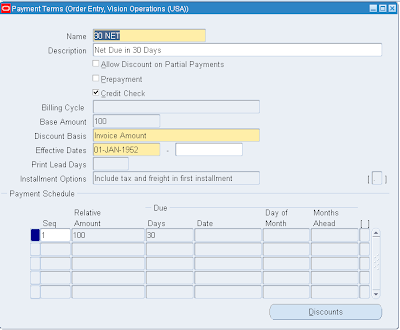 Invoice Amount: Choose this option to calculate the discount amount based on the sum of the tax, freight charges, and line amounts of your invoices. 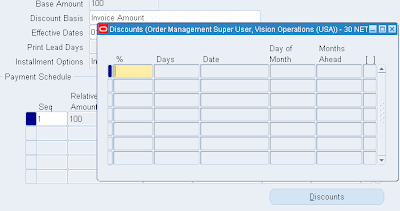 Lines Only: Choose this option to calculate the discount amount based on only the line amounts of your invoices. 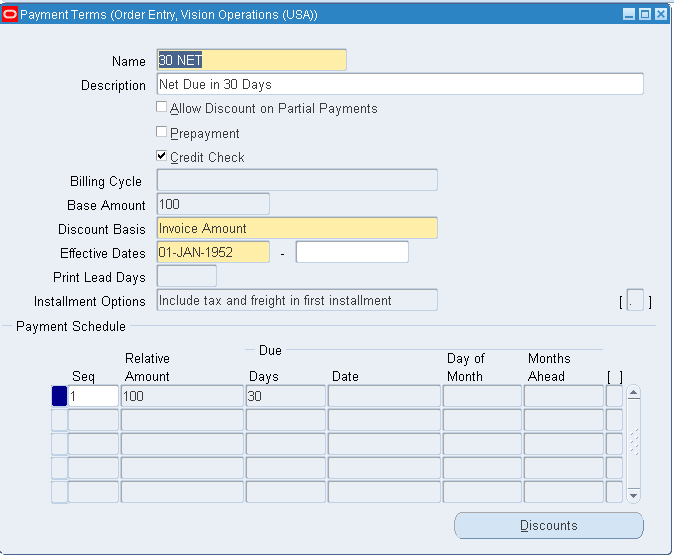 Lines, Freight Items and Tax: Choose this option to calculate the discount amount based on the amount of line items, freight, and tax of your invoices, but not freight and charges at the invoice header level. Lines and Tax, not Freight Items and Tax: Choose this option to calculate the discount amount based on the line items and their tax amounts, but not the freight items and their tax lines, of your invoices. Enter a range of Effective Dates for this payment term. If you do not enter an end date, this payment term will be active indefinitely. Enter a line number for the instalment term that you are defining in the 'Seq' field. Enter a higher number for each instalment term with a later due date. For example, if you create terms with 50% due in 15 days and 50% in 30 days, enter '1' in this field for the first line and '2' for the second line. Enter the Relative Amount for this payment term. This is the numerator of the ratio that Receivables uses to determine the amount due for this instalment of these payment terms. The sum of the relative amounts for all of the payment schedules that you define for each payment term must be equal to the base amount for this term. Enter the number of Days after the invoice date that payment is due for this instalment term (optional). For split payment terms, this number indicates the number of days after the invoice date that an instalment is due. Enter the Date on which payment is due for this instalment term (optional). If you do not complete this field, enter a value for either Due Days or both Due Day of Month and Due Months Ahead. If you are defining proxima terms and you entered a value for Day of Month, enter the Months Ahead to which this instalment term of the proxima terms refers. For example, if you entered '15' for Day of Month and you enter '2' here, an invoice dated in May will have a due date of July 15. Enter the discount percentage and number of Days for this payment term. For example, to give customers using this payment term a two percent discount if payment is received within ten days, enter '2' and '10' respectively. To limit the period of time that the discount for this instalment’s discount line will be active, enter the Date, day of the Month, and the number of Months Ahead for this discount's expiration date. Receivables uses these values to calculate the discount date during invoice entry.